I honestly can not say enough about a Wyndham Grand Jupiter Weddings. Even beyond that of what you see in the photos.. The people there are just the best you will ever encounter. Ask for Jennifer in the sales office. She is just a dream to work with. This image above is quickly becoming another one of my all time favorite. shots! This was shot in a matter of seconds in the lobby of the Wyndham Grand Jupiter on the wedding day. This one is interesting, because I have positioned the light in a way to create a “spotlight” on the wall. Then, I have turned my clients just enough where I can get them to clearly come out in the shadows on that spotlight, on the wall. The “repeating pattern” of the light balls is a great effect that leads the eye directly into them, and because this shot is more about the “graphics” and creative composition no eye contact was called for. Just a nice, romantic moment. Nice, and easy for them. Oh, yes.. classic me.. found a small glass table in the lobby.. and this was moved into position for my use to give that “mirror” that I love so much. To be clear, yes.. I also took about 20 other frames, and some were more close up, and did not have that “mirror” effect, however as a stand alone image presented in a gallery like this.. this take was the winner for me. 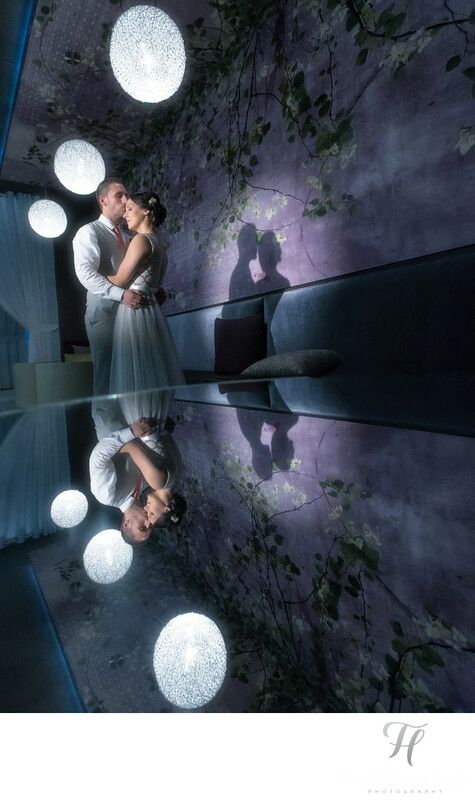 Check out all the other amazing shots we got from this wedding on my blog here. Location: 122 Soundings Ave, Jupiter, FL 33477.